I officially terminated my Maxis Broadband on 7th February 2009. Actually, I was visiting Maxis Center way earlier than that to terminate my Maxis Broadband account, but the Maxis stuff there suggested that I suspend my account for 2 months, then come back again in January 2009, and I will have RM200 termination fee waived since I’m using Maxis Broadband for 12 months. You can read about it here. I though my business with Maxis Broadband is over, but it seems that Maxis Broadband doesn’t want to let me go easily. 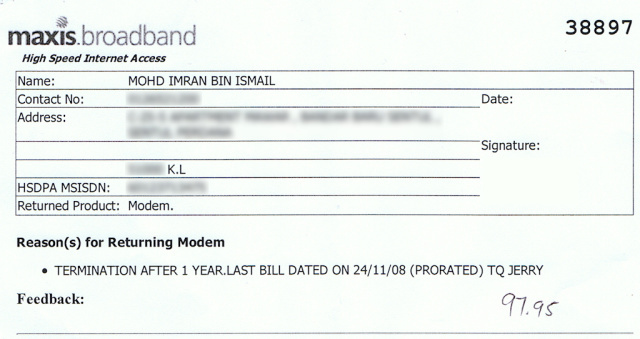 End of February 2009, I received this bill from Maxis Broadband with the amount of RM200. I just like – hey, what the heck. Looking at the details, the RM200 is for handing fee of discontinuation of service. But on the day that I close Maxis Broadband, it clearly stated on the form that the my account termination is done after 1 year. And they said RM200 is waived, and on that day, I only need to pay the last bill for this. So I guess this has to be the glitches in the system where my account termination has’t been updated yet? 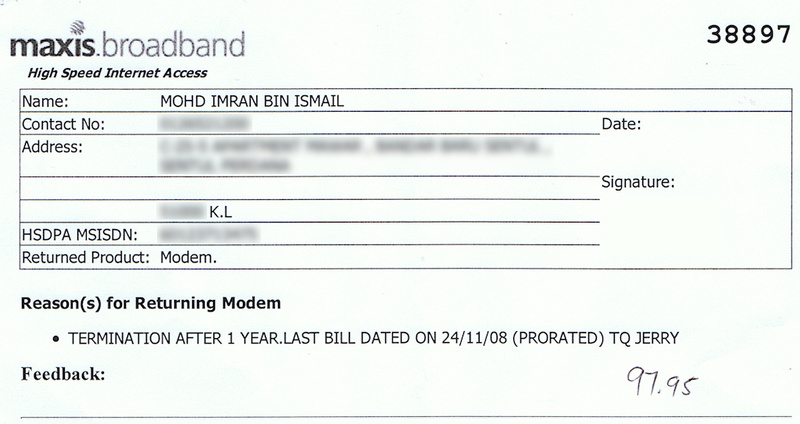 But again, end of March 2009 ago, I still receive the bill from Maxis Broadband. This is too much. So went to visit Maxis Centre KLCC today to ask, what is going on really? So the counter guy took all the forms that I got from account termination last time, and went to see his officer I guess. After a while, he came back and told me that – the reason why RM200 is still charged is because I suspended my account for 2 months. Therefore, I’m not using Maxis Broadband for 12 months. There you see. I guess they just make that up on that instant. I told them, the reason that I suspended my account is because the Maxis staff suggested this. Come on. How on earth that I can suspend my account with Maxis staff doing it. And if they are able to do is, it simply means that this is legitimate. I’m not going to pay that RM200. So the counter guy told me that I can ignore the bill for now, and he will call me back once they settle this. I’m really hoping for a good news. And if they still insisted that I pay RM200, then it means I have another visit to make to Maxis Centre KLCC. staff and the whole company CANNOT BE TRUST. Happened to my friend and they still not pay him for alsmost 1 year. taufik: uiks… what happened to your friend? huh? like that eh maxis? wah. saya suka kalau dpt tgk adegan kamu gaduh2 kt counter. pasti sewonot lg menghiburkan mcm tgk Naruto. len kali, pastikan anda pijak2 counter tu. kasi mereka kaget. tp pastikan sentiasa paparkan aksi senyum smpi telinga tanda mesra walaupun kamu tgh hot chili papers!